Cosmo Worlds 2.0 is a graphical modeling, animation, and scripting package for creating interactive 3D graphics for the web. Designed around the Virtual Reality Modeling Language, now an international standard for delivering interactive 3d graphics on the Internet, Cosmo Worlds is available now for Windows 95/NT. 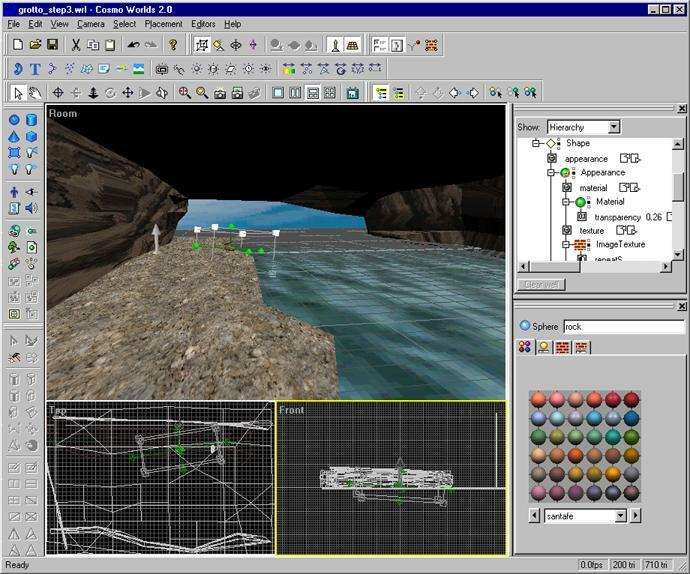 Previously available only on the SGI platform, Worlds was one of the first VRML authoring tools. In it’s latest form, the program is part of a family of web content creation tools which includes Cosmo Code, a JAVA development system, HomeSpace Designer, and a new animation program called PageFX. As a design medium, VRML offers many possibilities for creating fast loading animations, interactive banner ads, real time games, visualizations / simulations applications, and virtual worlds. We’re going to use Cosmo Worlds to create a virtual world with some interactive objects, animation, and sound. The project is the creation of an island cave environment with an underground pool. We’ll call it "the Grotto. Once it’s created, you can link the Grotto to other scenes, add game-logic in a scripting language or in JAVA, or develop it further as a multi-user world. The cave contains several interactive objects including a submarine which emerges from the water as you approach the water edge, an overhead circular pod door bay with a control to open and close it, and a natural vertical flowing water shaft with a spatialized audio sound effect. 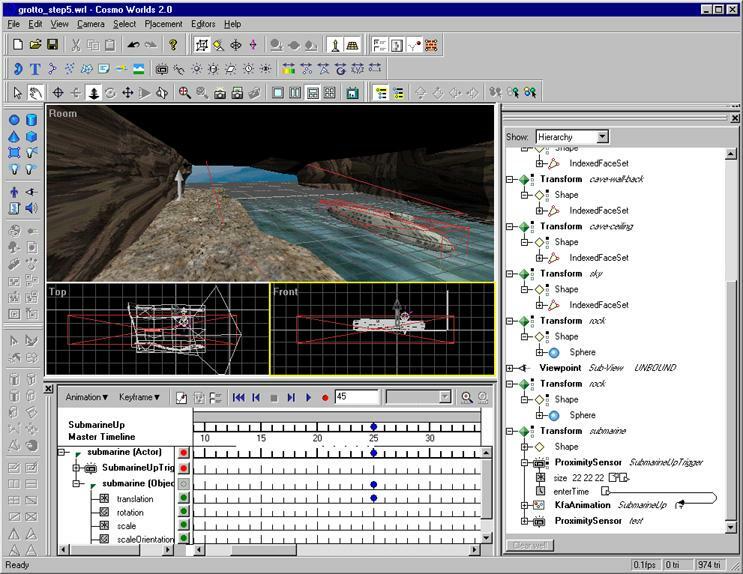 Cosmo Worlds has a simple interface that allows you to display and configure several windows, editors, and toolbars. To have handier access to all of World’s features, I found it’s easier to make sure that all of the program’s toolbars and main function windows are displayed. The buttons are intuitive, but the program’s ToolTips help you remember which buttons do what. In addition to the standard orthogonal and perspective viewports, an Outline Editor window and a Property Inspector window give you quick access to object properties as well as the Scene Graph of the world. For basic modeling functions, you don’t have to concern yourself with the Scene Graph, but you will need to get in there for adding interactive elements and any advanced scripting. If you’re not that familiar with VRML, it’s a good idea to leave the Outline Editor window open so you can observe the Scene Graph changes as you build your world. You’ll start to become familiar with VRML’s hierarchical node structure as well as common parameters of different nodes. We’ll start by laying out the basic Grotto environment. The cave is a rectangular interior space, which is open on one of the short ends. A cove extends into the cave and there is a path along the edge of the cove. To help you view the geometry, make sure the render style is set to wireframe for the orthogonal viewports and to shaded for the perspective viewport. . To create the cave walls, we’ll use the Create Face command to create a basic plane. Click in the front viewport to create the face and align it to the viewport. You’ll see a Transform node containing an indexed face set shape added to the Scene Graph in the Outline Editor. In VRML, every object that isn’t one of the basic primitives is an indexed face set. You can name the wall object in the scene graph by clicking on the topmost node in it’s hierarchy, the Transform node, and entering a label in the indexed face set field in the property inspector. As you get more and more transform nodes in your world, it’ll be easier to identify elements if they’re labeled. Naming elements is also important for scripting interactive behaviors. Elongate the face to shape it like a long narrow cave wall by scaling it non-uniformly. We want to sculpt the wall by adding some jagged edges and outcroppings now. An easy way to do this is to subdivide the plane into additional polygons and move various vertices perpendicular to the plane. To edit the points, edges, and polygons (PEP) of a VRML primitive or imported object, you have to switch to PEP editing mode. Select the plane and then select the PEP editing mode toolbar icon. A red line appears around the object indicating you are in PEP mode. Then, select the plane again and you’ll see various buttons become active on the PEP modeling toolbar. There are several different functions for splitting the plane into a greater number of faces. We’ll choose the one that lets us split quadrilaterals into quarters. To add some surface variety, select one of the new faces and sub-divide it using a different split function. Continue sub-dividing some of the other faces, but don’t get too carried away. You need to keep in mind that effective virtual worlds require efficient use of polygons. The overall polygon count can make or break your world in terms of what kind of machine is required to navigate through it smoothly with a decent browser window size. We’re designing the Grotto for an average Pentium class machine with basic 3D-hardware acceleration. 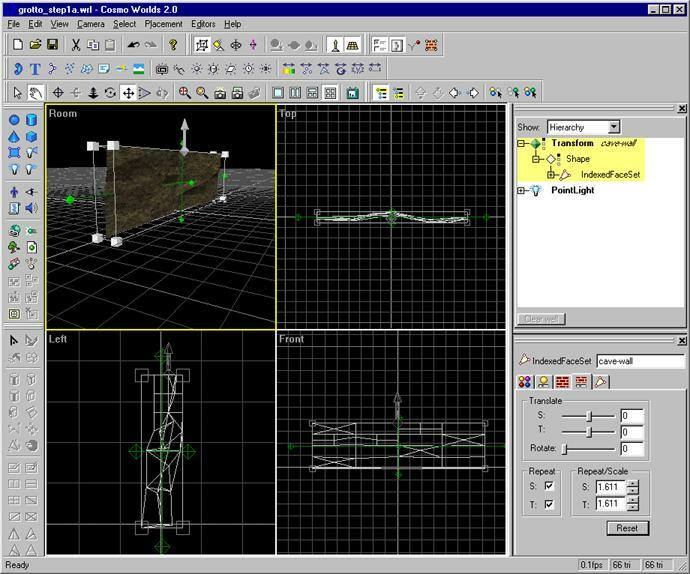 Worlds shows you the polygon count in triangles of both the currently selected object and for the entire world on the right side of the program status bar. Bottom line: good VRML worlds have polygon counts that are much lower than other types of 3d-design work. A good limit to keep in mind is 1500 polys or less. Still in PEP mode, we want to slide some of those vertices outward from the plane to make some outcropping areas. Select a vertex in the front viewport. Worlds offers several unique "Dyna" tools for transforming and rotating elements including the DynaBox, DynaPlane, DynaWheel, and DynaDot. These tools are powerful and fairly intuitive, although it will take you a little while to get used to their operation. Make sure the DynaBox tool is the only Dyna tool activated and then drag the selected vertex (or its bounding box) sideways in the left viewport. Continue pulling some vertices away from the plane, until the surface appears varied. Let’s add a rock texture to the cave wall. First, deselect it by clicking outside of the object. Select it again and then go to the property inspector panel. Switch to the texture palette and choose the second texture tile on the third row of the Dirt and Wood palette. You can see the file name referenced for the texture in the Outline Editor view of the scene graph under Transform -> Shape -> Appearance -> ImageTexture à URL. The texture from the library that we used is called ‘wood13.gif.’ Don’t worry! We’ll make it look like rock. We need to scale the rock texture appropriately for the length of each wall. The Texture Editor panel on the Property Inspector has convenient controls for translating, scaling, and repeating textures. I used the following texture transform values: translate S = 0.3, translate T = 0.48, Rotate = 100, Scale S = 2.144, Scale T = 2.358. You can use these or tweak the values interactively until the texture looks the way you like it. You might want to add a point light and move it around the scene to see how the texture looks when it’s illuminated. Now that we have a decent looking cave wall, let’s scale it and duplicate it to create the opposite side of the cave. Let’s also add a dirt path and a face for the water. Shape the cave by changing the angle slightly of the opposite cave wall. You can also move sets of vertices from sections of the wall by clicking and dragging once you are in PEP edit mode. Try changing the direction of the wall from the front to the back of the cave to make it look jagged. Shape the dirt path so that it has some surface contours and bumps near the water’s edge. Use the same technique of moving vertices to give it some variety. We’ll use the ‘dirt2.gif’ texture for the dirt path, which is the third tile on the Dirt and Wood texture palette. For the water texture, we’ll choose the third tile in the fifth row of the Nature palette. To make the water a little transparent, go to the Material Editor tab in the Property Inspector and set the Transparency value of the material to 0.26. Add a few rocks at the water’s edge using the sphere primitive and flattening them. Choose a rock texture from the texture palette that complements the dirt path and cave walls. To help visualize our world, it’s time to add a viewpoint. Click on the Add Viewpoint button and place a viewpoint near the end of one side of the cave wall. Label this viewpoint ‘Entry’ in the property inspector in both the name field and the ‘Description in browser’ field. This will allow us to reset to this viewpoint at any time once we view the world in the browser. Worlds has a Preview mode which uses the Cosmo Player VRML Browser as a preview window. In theory this is great because it lets you see exactly how your world will look and behave in its interactive form. The problem I had, however, was that the Player failed to initialize if I had set the program to use hardware acceleration. To get it to work at all, I had to switch to software Open GL even though my Diamond Fire GL 1000 Pro graphics accelerator supports Open GL hardware acceleration under Windows 95. Most times, toggling preview mode crashed the application or I got a message saying it would not work without Cosmo Player being installed correctly. Since I have what I thought was a correctly installed Cosmo Player, I usually opted to start Netscape and drag my saved project file into it to view the VRML rather than hassle with it. This is a minor inconvenience, but I hope Cosmo resolves the compatibility issues between the Player and Worlds so that they can work together more seamlessly with current hardware manufacturers’ display drivers. The world is starting to take form but it still looks a little flat. To give it some depth cues and interesting lighting, add a directional light pointing downward into the mouth of the cave to simulate sunlight. As with the low polygon design goal, you should also limit the number of lights in a world as this can really bog down a browser’s playback and navigation speed. We’ll add a large face perpendicular to the front of the cave and texture it with a sky texture. Adjust the UV texture scaling so you can see some blue sky and a few clouds. Make sure you scale the face rather large and set it a distance away from the cave so that it still looks like a distant sky when you walk along the path and look out at the open water from the front of the cave. Now it’s time to add a little mystery. We’re going to make a small submarine and submerge it in the water. Create a sphere and stretch it. Then create a small cylinder and scale it for the top of the submarine. 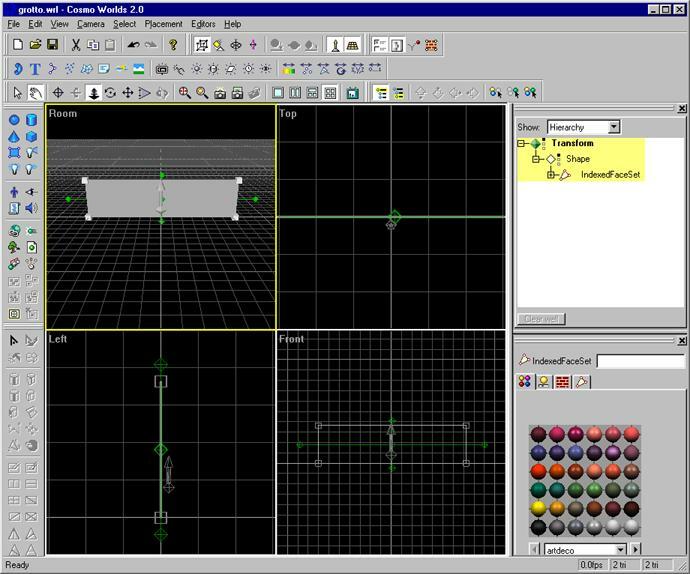 Select both objects and convert them to PEP objects using the convert button on the modeling toolbar. Once converted, select the merge button and combine the two so there is just one submarine object. Add a texture for the submarine (I used the first tile on the fourth row of the Color 2 palette since it looks a little like a metallic ship hull.) Lower the submarine into the water, making sure it’s completely submerged. Since we set a transparency value on the water texture, you should still be able to see the top of the submarine through the water. Using the Keyframe Animator, create a new animation, with the submarine selected. We’ll create a 25-frame animation with a keyframe for the submarine in the up position at frame 25. Add the submarine as an actor in the animation by clicking the Add Actor button on the Keyframe Animator's toolbar. Move the timeline’s dotted line to frame 25 by dragging the yellow diamond. Next, move the submarine to the up position and hit the record button next to the submarine-Actor line to set the keyframe. Preview the animation using the playback controls to make sure it’s right. This simple animation shows you how easy it is to set up some basic movement in your world. The keyframe animator can be used to create much more complex animations, including animation of hierarchies and coordinate interpolations. We’d like to make the submarine emerge from the depths of the cove as we navigate toward the edge of the water, and to do this we’ll take advantage of a proximity sensor. Worlds lets you easily set up different kinds of triggers for animations and scripted behaviors. Open up the Animator Properties window and click the Trigger Tab. Make sure the submarine Actor is selected in the timeline and then Select ‘Proximity Sensor.’ This will add the sensor to the scene graph. By default, the connection of the proximity sensor to the animation starting to play is not made. VRML’s event model uses ROUTE statements to make connections between sensors, so, using the Outline Editor, you’ll need to route the Proximity Sensor’s enterTime parameter to the submarine keyframe animation’s time sensor startTime parameter. That sounds a little intense but once you look at the Proximity Sensor and KfaAnimation nodes and their parameters, it will make sense. The Outline Editor allows you to expand or collapse nodes in the hierarchy so you can choose different levels of detail to view the structure. One last thing you need to do is to make sure the submerged submarine’s proximity sensor is large enough to trigger the animation. In the editor, change the sensor’s size parameter values to 22 22 22. You’ll see the red bounding box for the sensor around the submarine expand and cover the edge of the path. We’re ready to try it! Now preview the world or load it into your VRML browser. You’ll see the world load with the default viewpoint we set up called ‘Entry.’ Slowly move toward the edge of the water along the path until you see the submerged submarine. Continue moving slowly toward the edge and you should see the submarine automatically rise to the surface. Voila! The final step to create a finished world with Cosmo Worlds is to Publish the world. Although you could gather all the texture files manually and compress the textures and VRML file, this handy feature does all this for you and even checks dependencies for in-lined objects, textures, and script files. Publishing offers several optimization options including gzipping, floating point precision, and optimization of textures. Though some VRML browsers don’t support file compression, most do at this point so it’s a good idea to do this. The smaller you make the package that defines your world, the faster it will download. Once you create the package containing the VRML file and all it’s associated textures, you’re ready to upload the files to a web server. Make sure the web server you are using is set up to serve VRML files. Your system administrator should be able to let you know if it is. Then anybody with a VRML 97 compliant browser can experience your world. Click here to view the grotto world. In a future tutorial, we'll dig deeper into VRML and the interactive design capabilities of Cosmo Worlds.